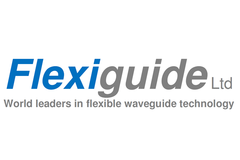 Flexiguide - RFMW UK, Ltd.
Flexiguide are the world’s largest producer of Flexible twistable waveguide products. Flexible / twistable waveguide core starts life as a spool of 0.1mm thick, silver plated, brass strip. The strip is then precision rolled into a three-dimensional profile before being helically wound around a rotating mandrel to forma continuous rectangular tube with uniform cross section and internal silver plating to minimize loss. Flexible / twistable waveguide is not pressure tight without a jacket. 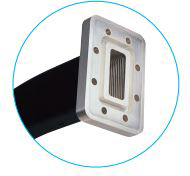 Flexible / non-twistable waveguide which is manufactured in a similar way to flexible / twistable waveguide with the addition of a solder wire which is later melted to prevent the waveguide twisting. This also reduces any RF leakage. Seamless flexible waveguide is manufactured from a thin brass tube, which is mechanically manipulated into corrugated form to produce a seamless flexible waveguide. The seamless construction generally allows for greater power and pressure handing although length is limited to 1 metre. .Polyurethane:-30 to 90C Polyurethane offers an excellent alternative to neoprene where the temperature range of silicone is not required. Polyolefin:-20 to 100C For a limited number of applications and for longer lengths we can offer an adhesive lined polyolefin heat-shrink jacket. Due to the nature of the jacket, moulds are not required and lengths up to 5 metre are available depending upon waveguide size. Intelligent design and the use of superior materials are the hallmarks of Flexiguide’ s products, making them the first choice for clients demanding cutting edge performance coupled with cost effective long term reliability. Advanced manufacturing techniques and innovative processes enable us to offer rapid delivery on both large quantity orders & bespoke items. Our dedication to customer service and value has established our reputation as being the global supplier of choice within the telecom, satcom & defence markets.